Maybe its just a stunt because cycling in Cairo will kill you and how many food packages can a cyclist carry – 1?. In any event its about 1 k from Dokki to Zamalek and there are no poor in either place. All the cyclists look fat and a few obese. As usual the nice young Major in Central Security organizing it is an idiot – Gandhi’s birthday is not 6 April but 2 October which 2 seconds on the internet will confirm. Their stunt bike are just that heavy duty sprung with no panniers to hold the food for the poor. The only reason for a sprung bike in the elite part of the city is that the roads are bad – another achievement by the 5 million Egyptian engineers. Even the slightest story when checked/looked into just evaporates one way or another. It would be anathema to him to hand out food because for him it was freedom, get the British out and self reliance, things Egypt can’t even begin to imagine. Gandhi loathed authoritarian and military governments and as a fine barrister believed in rule of law, something no one believes in Egypt. He was a man of integrity and poverty unlike some others. Like much in Egypt you wonder why and then you wonder how. I suspect its just another idiot stunt to make the world think that Egypt is OK. I would apply a similar comment to high matters of state. "The embassy of India in Cairo, in coordination with Cycling Geckos, a prominent group of cyclist women in Cairo, will be organising a cycling event on 6 April in celebration of Mahatma Gandhi’s 150th birthday ..."
As usual the nice young Major in Central Security organizing it is an idiot – Gandhi’s birthday is not 6 April but 2 October which 2 seconds on the internet will confirm. New Delhi: The Narendra Modi government has lined up a string of events across the globe to commemorate the 150th birth anniversary YEAR of Mahatma Gandhi, which would include a global cycling event, a vegetarian food festival, compilation of a ‘Gandhi Anthology’ with write-ups from 150 globally renowned persons, and promotion of khadi abroad as an “idea” and a “health solution”, and not just a “garment”. A dozen events have been lined up, as per a government note reviewed by ET, to pro .. Thanks Bennu. I'm not sure at this stage That India is doing full credit to Gandhi and what you describe smells of publicity stunts rather than something Gandhi would have wanted. Mohdi is no Gandhi. I missed another fracture in this propaganda/invented story. 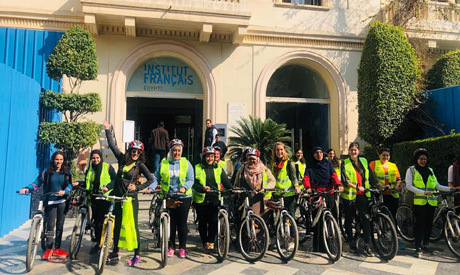 Their bikes and large posteriors are photographed outside not the Indian Embassy but the Institute Francais which is obviously having an Indian day - maybe not. Maybe these mesmerizers just got lost. Maybe the nice Major from posterior security can't read or maybe he can't read a map. Maybe France is the same as India or maybe France is paying the bill on this little jaunt. Relations between India and Egypt are far from good and a visit by the Foreign Minister Soukry 2 years ago or so was a bit of a laugh and accompanied by lots of Indian newspaper articles on the crackdown in Egypt including in the excellent Times of India. India takes free speech and democracy seriously as did the great Gandhi who needs better than the accolades one of the least free places on earth that share none of his values. Gandhi, his supporters and his Muslim allies took the initiative and grasped their freedom and made tings so difficult for the UK that the latter were driven out whereas Egypt could barely organize anything to win its freedom and stuck with its dreadful Albanian king until 1952. Egypt is about division whereas Gandhi was about unity, responsibility and mutual respect. There have been no subsequent visits. Several million Indians fought for the allies against the Ottoman Sultan and Calif and representative of God on Earth in WW1 and and also against the Nazis and Nazi French in 2 including in Gallipoli and North Africa whereas Egypt just reclined, so to speak, in both wars and others and collected the 'toll payments', provided the prostitutes and, with Sadat and the Grand Mufti of Jerusalem (who 'used God;s power' to anathematize Christians and the allies and glorify the Nazi's), backed the Nazi's. The two countries could not be more different as have their leaders and Ghandi's devotion to the poor is near unique. No poor people in Dokki, really when were you last there? I have seen enough on my visits. There are no door keepers who have to sleep on the floor of the entrance to buildings, no people who are employed to clean and guard cars? I suppose these people are on a fantastic salary. No poor people in Dokki, really when were you last there? I have seen enough on my visits. I do once remember reading a statement attributed to a prophet from the East, it is said that once he remarked that the poor are with us always, in places like Dokki and Zamalek districts of Cairo, like this is so in Fulham, Chelsea, and dare I say it St Katherine's Dock in London, but they certainly do NOT rent or own property in any of those areas. I didn't say they rented or owned property in Dokki or Zamalek but they certainly live and work there. but they certainly live and work there. I live in very central London, when I am away, which has been quite often recently, a really wonderful lady keeps my place in brilliant condition, she works here, and I think I pay here quite well, but one thing that is for sure as with Dokki and Zamalek, Cairo NO WAY can she and her young son afford to live anywhere near here,..........and no, after work she don't live on the streets where I live. Often I come across young people from the 'new' Europe working in restaurants etc, whenever I have a chat with such people, I always tell them even when you have full employment in London and live on the border,......you simply survive. Anywhere away from London you begin to live, and the British people are far more friendly. Do you for one moment think Dokki or Zamalet Egypt is any different ? Further to my above post, I am sure that those with little knowledge on their first visit to Luxor, would think that most of the properties in Gazerra WB, Luxor are of a very extreme poor quality, and that poverty there must be on a some what rather biblical scale, though I am sure you, and perhaps a couple of others could give an almost convincing picture of the opposite if you really tried. . So what are you saying now that there are poor people who live in Dokki or not? As for London, outrageously expensive property but there are poor people who live there, Grenfell Towers? There are many poor people who work in Dokki and Zamalek, but they certainly cannot afford to live there. Many ordinary people (some would say poor) work in the very affluent area of London called Knightsbridge, but one thing is for sure, they neither own or rent property there for the very simple reason is that their income could never possibly cover the monthly mortgage or rental charge. This would also be the case in Chelsea and Fulham, yet there are other area of London that may be affordable. P.S.- What on earth has Grenfell Tower got to do with this subject,...... . I mentioned Grenfell Towers as an example that despite the cost of buying property, (which you raised and really had nothing to do with Hafiz's post) in London poorer people are still able to live there. As in Dokki, my son lived there recently and I can assure you that poor people do live in Dokki. Some of who we got to know. Door keepers who have a bed under the stairs and are allowed to have one night off every two weeks. Cleaners who get very poor accommodation and wages. I would supply names and addresses but it would be a breach of their privacy. Also there are a number of Sudanese living there who do menial work and get paid a pittance. It's not a secret so that is perhaps why you don't know. Also there are a number of Sudanese living there who do menial work and get paid a pittance. It's not a secret so that is perhaps why you don't know. Well actually, I think it is a secret from you, because these people are certainly not Sudanese, these people are from a very old tribe of people who, for example, first brought into Egypt, and educated the ancient Egyptian as to the use of the shaduf. They are in fact a proud people known as Nubians, and as a rule take offence to even being referred to as Egyptian, though to the average European tourist, they know that these people have little knowledge. As many as 50,000 of these people were displaced by the building of the High Dam. President Anwar Sadat himself half Egyptian, half Nubian, ensured that most were given land to farm, some went into Ethiopia, though many came to work for the very wealthy Cairo families in either Dokki or Zamalek. These people are even now highly praised for there honesty, hard working, and pleasing manner, and therefore are able to command a very good salary, even when living as part of the household, which often is the case. Sad as it is, though many work in these expensive areas, they can neither rent or purchase property there. . I often read on here that people visit a Nubian village in Asswan, but in all honesty I have not seen a true pure Nubian man or woman in Asswan in the past fifteen years. There are thousands of Sudanese refugees in Cairo, some working as cleaners and house keepers - why not in Dokki or Zamalek? A Sudanese friend, living in Scandinavia, went to Cairo to visit his father at a hospital. He met more childhood friends there than he would expect to see in Karthoum.